In the 2 years I rode these trails I did it at times of day, and days of the week, when I rarely encountered other trail users so rarely thought of there being any problems. But when you have walkers, joggers, roller bladers ( Seen today. ), skateboarders, equestrians, high school cross country, and track, teams ( Seen on my recent ride on the south side ending my trip on the Mtns. to the Seas Trail. ), nature tours, the occasional public event, individual cyclists, and groups of cyclists ( And some of the walkers/joggers, and cyclists, have dogs on leashes. I saw both today. ), using the same resource, the issue of safety seems to me to be one of the utmost importance. I finally had the time to check out the website of the City of Newport Beach, this afternoon, to see what there was to learn. 12.24.090 Prima Facie Speed Limit--Fifteen Miles Per Hour. B. 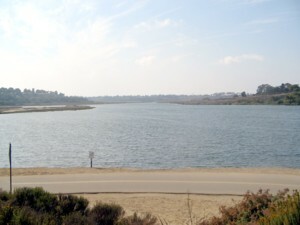 Within the Upper Newport Bay reserve there is currently an eighteen (18) foot wide, asphalt paved mixed-use trail shared on a daily basis by, among others, walkers, joggers, hikers, bicyclists, sight seers, birdwatchers, rollerbladers and vehicle traffic for scenic and recreational purposes at differing speeds and frequencies. There are no dwellings on either side at the trail, no vehicular cross traffic is allowed and the trail allows for only one direction of vehicular traffic. There is a double yellow line which separates the one way vehicle traffic from other uses of the trail. C. Due to changing weather, frequency and intensity of use, changing irregularity of surface conditions due to natural settlement, drainage and erosion, stress from traffic and interaction with other controlling State and local agencies, it is difficult to inspect and maintain the trail to reduce or eliminate substantial risks of injuries to users, thus potentially exposing the City to liability. D. These provisions are necessary to protect for the health, safety and welfare of those using the trail. “Bicyclist” means any person operating any device propelled by human power through a belt, chain or gears and having one or more wheels. “Pass” means to travel to the left of the double yellow line of the trail. “Pedestrian” means any person on foot. “Rollerskaters” means any person wearing rollerskates as defined in Section 12.57.010 (B) of this Code, rollerblades or any similar device. “Skateboarders” means any person riding a skateboard as that term is defined in Section 12.57.010 (A) of this Code. 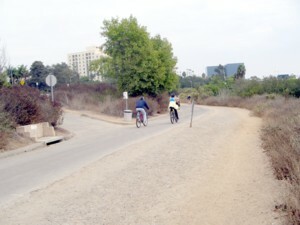 “The Upper Newport Bay Recreation and Scenic Trail” means that asphalt paved mixed use portion of Backbay Drive adjacent to the Upper Newport Bay between Shellmaker Road on the South and Eastbluff on the North. ****A. No bicyclist, rollerskater, skateboarder, pedestrian or vehicle operator shall pass any other person except when it is safe to do so. A. The Traffic Engineer shall have the authority to establish other special restrictions on bicyclists, vehicles, pedestrians, skate boarders, and/or roller skaters such as localized speed limits less than fifteen (15) miles per hour. A. Not withstanding any other provisions of this Code, any person violating the provisions of Section 12.55.030, 12.55.050 or 12.55.060 shall be guilty of an infraction, punishable by a fine not to exceed fifty dollars ($50.00). Okay, all you happy people, by a show of hands, how many of you knew any of this, or even cared to find out? I knew the speed limits by observing the signs, but never thought to go snooping about the city website for info until the need arose for this story. ****A. Prohibition. No person shall operate or ride a bicycle upon any sidewalk in the City. d. Twelve (12) inches in rear tire diameter. After reading all this my initial thought was why were there no signs on the north trail telling cyclists, entering, and riding it, that the speed limit is 15 mph? Then it dawned on me that the Code is only talking about activity on the SOUTH SIDE! It is interesting that the code makes the point that the Bike Lane on the south side is considered Multi-Use, and the "Street ' side is for MOTOR vehicles. I don't recall seeing signs telling walkers, and joggers, to stick exclusively to the Multi-use Trail side, and to do so regardless of their direction of travel. Is it me or does the the Code imply that eastbound cyclists must use the Multi-use as well, and not use the traffic lane like other "Vehicles"? The High School Girls Cross Country Team, from a local High School, took up the whole eastbound lane for a good chunk, from the hardchargers, to the stragglers, the day I saw them. 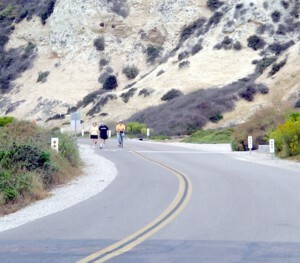 Walkers, and joggers, use the side of the vehicle only road, in both directions. Individual cyclists, and Club riders, ride east in the wider lane as a vehicle should, though frequently faster than posted speed limits. It has always been so as far as I know. I wonder why there is no mention of the north side in the Code, and why no speed limit signs, other than at the long trestle, exist over there? After my initial trip to the Bay, for this story, I went to the website of the Newport Beach Police Department as the Ranger and Sheriff suggested. I found a bit of confusion when I discovered the map of the "Beats" that make-up the area around the Bay, and so wrote to the webmaster. The Map on the Calls for Service, and Crime Info pages, seemed to show multiple Beats sharing responsibility for the Trail. I am doing research for a story on my BikeBlog. sides of the Back Bay. Reports, but don't know which ones are appropriate. encompasses the bay itself if I understand the map. Or is there someone else I need to contact? the trails I think there is a story here, especially after things I saw on a recent 4 hour visit down there. I'm also looking into who to contact in local gov about this story. If we can help in some way, we'll certainly do so. I recently spent 4 hours on a weekend on the trails, observing, and noting especially the entrance trails from side streets to the north side trail. 31 = Apparently the Trail that parallels Irvine Ave. is here. 33 = Apparently the whole north trail from University Dr. east to the corner of Jamboree and Bayview Wy. This encompases trail entrances at Mesa Dr., Pelican Ct. and Bayview Wy..
36 = The trail along Jamboree from Bayview to EastBluff, and along East Bluff to Back Bay Dr.? 35, 37, and 41 = Each shares a portion of the Back Bay Dr. from East Bluff to Jamboree and the nearby park at PCH. Does that match up with what you know? That's why I was confused, and wondering if 32 covered activities along the trails themselves. While I've been blogging 4 years this story, and another one on Motorist vs Cyclist incidents in Orange County this year, that I'm working on ( A cyclist outraged over the recent accident on PCH that made the news, led me to this one. ), are new efforts for me. A jogger wrote me about problems on the trails, and so I talked to rangers, hung out, and took photos. What I saw, and heard, that day was troubling. So that lead me to try to learn about reported incidents of various types, over this , and last, year. I think it is important that the local cycling community is made aware of issues regarding trail usage in this area, because it uses the trails so much, and will be doing it even more now that it is part of the Mtns. to the Sea Trail. You've pretty much got it in terms of the RD's. info that we can address with our Traffic Division. Imagine my surprise when, not long after this last correspondence, on the 12th, I discovered an e-mail request from Sergeant William S. Hartford, the Community Relations Supervisor for the Newport Beach Police Department, to call him on the phone! It took a few days but we finally connected. He was very interested in what I was doing, and offered to help answer any questions I had. According to him officers in the Beats respond to calls for service, or respond to activities they observe, but he gave no indication of how frequently officers actually traverse the trails themselves, and I didn't think to ask. He said that as far as he knew there had been no serious accidents in some time, and that reported incidents such as attacks, indecent exposure, homeless vagrants, and other offenses, were minimal to rare. He said that if I found anything of interest in the online reports, that he might be able to provide more info, and he also suggested other people to contact. I've done 6 chapters for this story so far, and now want to spread the word to area, and state clubs, and organizations, and to bloggers, and others, in my side bar. The hope is that these folks will find this story important, and interesting, enough to spread the word about, and write about. I want to hear from people, and the fact that some folks are already weighing on their own, in the comments, is a promising beginning. This is why BikeBlogging is important. This is one of the reasons I created The Cycling Dude, over 3 1/2 years ago. 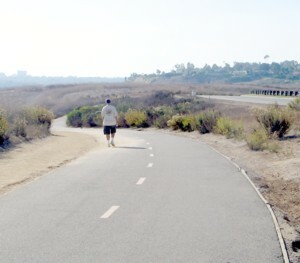 The Upper Newport Back Bay North Trail, stretching from an entrance off Jamboree, to one off Irvine Ave., near Santiago Dr., offers views of nature that are quite beautiful, and because of that, a lot of people find reasons of all sorts to hang out there, not least of which includes visiting the Interpretive Center. So many people that issues of safely sharing the trails of this resource recently came to my attention ( Begin at Part 1. ). Continuing where I left off, last time, I want to talk about the area off University Dr., just east of Irvine Ave., and an ecounter with Rangers at the Center. After passing the the smaller trestle, one travels west to the entrance of the Interpretive Center parking lot. To do this the Trail crosses 2 driveways: 1 for the center itself, then another to the parking lot. Signage is nice, except there is no mention of speed limits. Sherry, my e-mail correspondent, told me of seeing cyclists, going too fast, coming east ( The view of this, and the next Photo ), losing control, and hitting the pylons seen in the middle of the trail. Both were wearing helmets, and seemed to be having a grand old time. They were on an unusual tandem bike. A regular bike with an attatchment to the rear wheel that extends a bit lower, and has a 2nd seat with handlebars, and a pair of wheels. They were heading, past the driveway, toward the trestles, at maybe 15 mph., with Mom talking over her shoulder to the child. The stretch of trail, between the 2 entrances, has a dirt section, that rises, then lowers, parallel, to the paved section. Walkers, Joggers, and Equestrians, use it. After I took this photo, and put my camera away, I saw that it is a tempting place for cyclists to ride as well. I watched a cyclist, starting at the 2nd pylon,, head east, zig-zagging up, and down, the little cliff, you see rising, between the 2 trails at a high rate of speed. Luckily no other traffic was there, except a friend riding the path, and laughingly kidding her companion for his stupidity. I shook my head, and watched, wondering what he was thinking. There are small signs aplenty telling cyclists to stay off the equestrian, and hiking trails, but apparently they need to be of billboard size for anyone to pay attention to them. The parking lot has plenty of space, and even has a nice bike rack ( I'd like to see a 2nd one installed. ). As I walked the path I saw ample evidence that cyclists ignored the signs. The parking lot, and University Dr., are used not just by those visiting the Back Bay on foot, but by cyclists, including, on occasion, those riding much farther than just around the Bay, and back. As I approached the entrance to the Center I encountered a Sheriff's Deputy, a Park Ranger and, eventually, a man who manned the desk in the Center. I talked with all of them about issues on the trail, and got an earful. 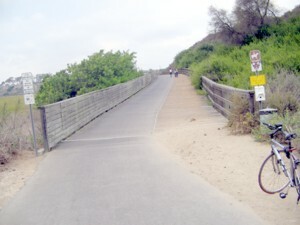 The Trail System is owned by the City of Newport Beach, and patrolled by County Park Rangers with the Harbor, Beaches, and Parks Dept., as well as city police who respond to accidents, calls for medical aid, and other issues. The Ranger confirmed to me that they can give tickets for observed offenses against posted regulations, but can't be everywhere at once. She confirmed stories I'd been told about safety issues, and the use of the north trail by groups of cyclists riding too fast, the occasional accident on the trails, and cyclists riding where they shouldn't. All 3 officials felt the safety issues are real, and required more awareness, and co-operation, between all users of the trails. I was advised to check out the city website, and contact the Supervisor of the Parks Dept. to learn more. Contacting the city was next on my agenda, and now that I've got this series up and running I'm going to try to get in contact with the Parks Dept. as well. After getting back on my bike I headed east on the trail again, to start my journey home, planning another visit as soon as I could for the last stretch of trail ( I had no more room for pics on my camera. ). As I approached the driveways I saw 2 young couples in their 20's, 1 with a Baby Utility Vehicle ( BUV ), approaching the trail to head toward the trestles. 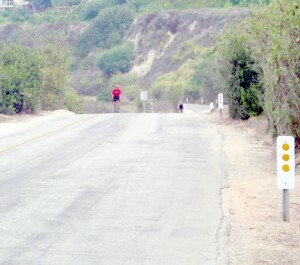 I stopped, and advised them to be careful of cyclists on the trail. "Thanks for the advisory, but if you don't mind we came here to walk, and talk among ourselves..."
"Okay, I'm sorry for the intrusion", I said, "just be careful, safety is important here." They went on their way as I stopped to looked at the signs near-by. Eventually, after the 2nd trestle, I came up behind them again. By now they were taking up the whole trail, 4 abreast, the BUV in the center, walking along, and chatting, oblivious to anyone else around them. They vocally did not appreciate my loud "On Your Left!" from behind, and I barely was able to pass. I stopped ahead, and calmly said, "Look, safety is a 2-way street, you know, others use this trail." I was barely able to get those words out before they vocally showed their disdain some more. I shook my head, and continued on my way. I returned to ride the last portion of the North Trail, this morning, between 9 and 10am. 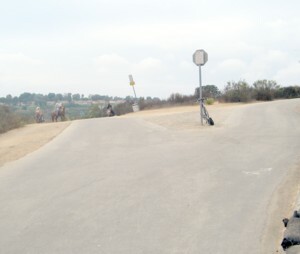 It is a winding, hilly, stretch that runs south, parallel to Irvine Ave. ( Seen on the right here, near University. ), between University and Santiago, and has a half dozen blind curves, as well as a good portion with an Equestrian Trail along it. There are no posted speed limits, along here, so whether the cyclist chooses to go at a leisurely 10mph, or race thru at twice the speed, even around the curves, is up to the judgement, or lack of it, of the cyclist, or group of cyclists. When I returned to the parking lot to get my bike I met another cyclist, and asked if he regularly rode the trails. Randy said he did, and we got to talking about safety on the trail. I hope he stops by to leave a comment because he is one of those who has seen club rides, of up to 20 cyclists, using the north trail, taking both lanes, and at speeds much too fast for the conditions. He also told me of several encounters with groups of people on foot, crossing from 1 side of the trail to the other, without 1st looking in either direction to see if there was any oncoming bicycle traffic. 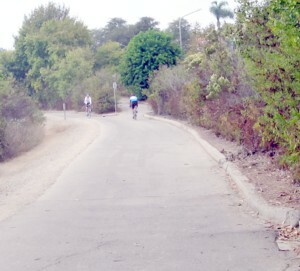 As we chatted we observed several cyclists riding together, single file, at a high speed, having just came from the last stretch of trail, and heading east across the driveways, toward the trestles. As I rode the trail I came upon a man walking on the wrong side, and pulled up alongside of him, between the 2 curves in the trail, stopping in the dirt. ME: Are you at all concerned about cyclists coming around these curves, or toward you on the straight-aways, and getting out of their way? WALKER: Oh, no! They are watching, and so am I. ME: Many cyclsts, based on my observations of these trails, are not, though, and even ride too fast. What if you, them, or both of you at the same time, were not paying attention at the moment of your approaches, what then? WALKER: ..... ( PAUSE, then an exasperated look. ) I can get out of their way in time. I shook my head, and said that there was a lot of unsafe behavior here, and went on my way. He bent down, as he eventually caught up with me, picked something up off the dirt, and handed 2 long thin strands of metal-like material to me, complaining about how these come off the street sweepers ( Used on the trail, or just on nearby Irvine Ave. wasn't clear to me. ). He wanted to know why those things were not removed? Not having seen, or heard of, the sweepers before I had no answer for him, and continued on my way. As I approached the last uphill, and bend in the trail, as it heads up to street level, I stopped to wait for northbound cyclists. Eventually something else of interest approached, from behind me, and I knew I had my last shot. 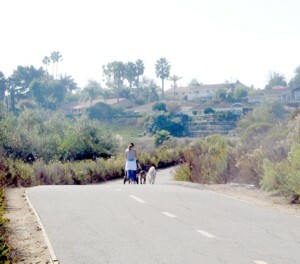 A woman jogger, with one of those Jogging Strollers, and 2 large, nice looking, friendly dogs on a leash. My 1st thought was that, on this winding stretch of trail, she was an accident waiting to happen. Sure enough after I put my camera away, and got on my bike, 2 cyclists come barrelling down that hill, from around that bend, at more than 20 mph. I came upon the lady at the top of the trail, and asked her if she ever had bad encounters on the trail, especially at the curves, and she said no that she had not, and maybe this was just luck because she did have concerns about the speed of cyclists. I told her that seeing her go by me toward the bend I had a vision of a herd of cyclists barreling down on her, and then seeing the 2 cyclists speed by a few minutes later wondered what would have happened if they had been just a few minutes earlier in their travels, and she was spread across the road trying to handle 2 dogs curious about something on the opposite side of the trail, and her stroller. She nodded, but didn't seem too bothered by the thought, despite her previously mentioned reservations. The trail was obviously a place she enjoyed using despite the safety issue. Someone mentioned to me, recently, that they could not understand why many designers of multi-use trails, like these, seem so enamored of including winding paths, and blind side entrances, and then doing little, or nothing, to make sure users know of the speed limits, and other safety issues involved in using the trails? There are thousands of miles of such trails all across America, some have excellent signage, and other programs, for educating users, but I'm sure many do not. I'd love to hear from other users, and officials, from all over, about the issues, and questions, I've raised. In my next post I detail what I learned when I contacted the Newport Beach Police Dept..
Ladies, and Gentlemen, Boys and Girls, Cyclists, and non-cyclists! Welcome to the 9th edition of The Tour de Bicycling Blogs! There are a growing number of Bloggers with sites dedicated to the proposition that bike riding is good for you and fun. In various ways we all provide commentary, and opinion, reports about events, and news, write reviews, stories, and travelogues, share photographs, and spread the word about the wide variety of websites of interest to anyone who rides a bike. BikeBloggers spread the word, and the word is BICYCLE! This ongoing series is about bicycling, and bicyclists... Recreational Bicyclists, Bike Commuters, and Activists. It is about those of us whose blogs are devoted to writing about our bicycling escapades, and about anything else cycling related that catches our attention. Expect to read my own thoughts about some, or all, of what I bring to your attention. Let's saddle up, and ride! Ed, The CycleDog, is an active rider, and cycling instructor, and very involved in cycling in his community. He has been blogging since December 29th 2004. There is a reason why I chose to make his work the sole focus of this edition of the Tour. I anticipate writing about common cycling subjects like commuting and racing, "how-to" pieces on various subjects, and some of the experiences of riding on the road. I take a slightly twisted view and try to inject some humor. From not being sure, to celebrating 40,000 visitors on October 14, 2006. Wow! Forty Thousand hits on CycleDog since I began writing this. As it turns out according to this cheap datalogger that I got second hand from the defunct Psychic Friends network, Mr. 40,000 is a middle-aged white guy with thinning hair, who's slightly overweight. He's sitting in front of his computer reading CycleDog while sipping a beer, and he's wearing just a ratty pair of boxer shorts. I really need some new boxers. A milestone worth celebrating ( The 40,000, not needing new Shorts, you sillies in the Peanut Gallery! ). Here's a new feature that will likely be a monthly item. It's an award for the most egregious act involving a cyclist in the last month. The winner, of course, has to receive some sort of prize. I think it's most appropriate to make that a tin of Bag Balm, so each and every winner will receive a brand-new can of the stuff, provided they're willing to pay shipping and handling! Cash only, no checks or credit cards. Bag Balm works really well on saddle sores. Trust me. All decisions are final, though some may be capricious, arbitrary, and rude. The judge reserves the right to mete out sarcasm and disrespect. The 3 August winners, and his comments, can be read here. After missing Sept. he comes back strong for October, ripping Karen Mango of Huntsville AL., a Huntsville Times "community columnist" , a new one for the screed she wrote for the paper. These pieces, found by Ed, are perfect for reading, and thinking about, as complimentary material to the pair of Cycling Safety series I'm in the midst of writing. 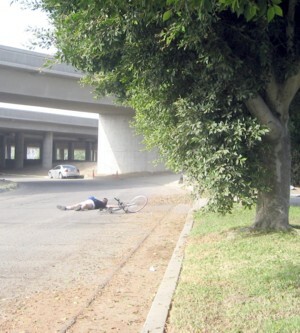 Scenes like these, among many others, are being played out on streets all across America, and the world, and yes, sometimes the fault even lies with the cyclist. In a brilliant piece, in August, Ed went off his meds, and reports on what I call the "Bicycling Community's Master Plan for World Conquest". It's common knowledge that all cyclists are scofflaws, intent on flagrantly disobeying every traffic law ever devised. They rip through stop signs and traffic lights. 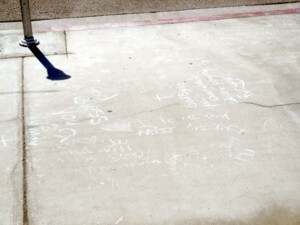 They blaze along sidewalks, scattering pedestrians in their wake. And they piss off each and every decent, law-abiding motorist they encounter. Cyclists are vermin. Worse yet, they're all tree-hugging greens and liberals, bound by a common thread of far-left ideology. They won't be satisfied until the whole trafic network is brought down to their level and good people everywhere are forced from their cars onto those infernal two-wheeled death machines. Cyclists enjoy a secret underground communication system that keeps all of them on message, a system that rivals the Republican party's talking points for it's all-encompassing nature. It's uncannily accurate and capable of overwhelming nearly any opposition. Every cyclist in the country is plugged into the network, and they're all true believers in the cause. This spilling of Community Secrets has put the ultimate success of The Plan in serious jeopardy! We need to flush out the informers!! The variety of subjects covered on this blog, and opinions expressed, are well worth your time, agree, or disagree. The Upper Newport Back Bay is a beautiful place and, because of that, a lot of people find reasons of all sorts to hang out there. Standing above the junction where the Back Bay Trail meets the entrance to the San Diego Creek Trail, any time of day, any day of the week ( This photo was taken as part of my, soon to be presented, trip on the Mountains to the Sea Trail. ) shows off the glory that is this bit of nature in suburbia. After checking out the signs at this intersection, as described in the last chapter, I then headed over to the north side of the Bay, by far the busiest stretch of the areas Trail System. There are several reasons for this, from easy access to parking, to the hiking, and equestrian trails, to the Nature Center and its programs. The nearly 2 miles of paved trail on the north side is narrow, and has several access points, some with safety issues. As I headed west I checked out each, talked with people I encountered, and observed some troubling behavior. North of the 1st section of trail is a short stretch of street, called Bayview Way, heading west from Jamboree, on which people can park, and enter the Bay Trail thru 2 short access trails. The 1st entrance has a blind spot, as you can see, for anyone heading east on the main trail, and the access. I watched these cyclists, and wondered what would happen here if a group on the main trail encountered a fast cyclist, teen skateboarder, or walker with what I call a Baby Utility Vehicle ( BUV ) coming down the access. The same issue, from the opposite direction, occurs at the 2nd access point, as you can see from this view looking east. Yes, the dirt is the Equestrian Trail, and bike tracks can be found on it, and the various hiking trails, in the area as well causing their own problems. at a speed faster than the recommended ( More on that in a bit. ) with no warning to the person on the left. I talked to a few people on foot who expressed concern about individual cyclists riding the narrow trail at high rates of speed, and about Club Rides doing the same. Again I heard from people who were verbally abused, but also from those who had positive experiences with cyclists. I also heard from a couple of cyclists who had views similar to those of cyclists on the south side. While I know that the trail is for all I have to wonder at the reasoning for a club to use this short trail, regardless of its connection to the San Diego Creek Trail, knowing what they could encounter, especially on weekends. Moving along I came to the Cyclist/Equestrian/Pedestrain Access to/from Mesa Rd. Here is a nice stretch that, at its neighborhood entrance, is next to Bayview Park, and is a favorite access point for all the Equestrians who live in the adjoining residential area. There is plenty of room here yet I learned that some cyclists, coming down the access, get a tad carried away, speedwise, thus spooking horses, and causing annoyance to other users as well. It was here that I stopped to talk to the folks seen on horseback in this picture. Sheila Ferguson, and friends, use the trail all the time for their excursions, and are part of a community organization called the Back Bay Equestrians. She added to the stories told me by others, positive, and negative, and added that cyclists riding too close to the horses can sometimes spook them. Anyway, I understand some riders do clean up after their steeds "pavement pauses". 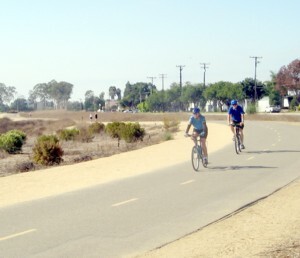 We estimate that there are over 700 miles of natural surface, shared-use recreational trails in Orange County. Every year, the number of people using and enjoying this land increases while the budget for the Orange County Park System decreases. To learn more visit the website of this award-winning organization. The important thing to understand about the north side is that, because of the narrowness of the trail, the intersections, and the number, and variety, of users at any given time, the speed limit is not the same as on the south side. What that speed is is not readily apparent, however, since the speed limit is not posted at the main access points, on the east, and west, entrances to the trail. See that white sign on the left? It tells cyclists that the speed limit on the long Trestle is 10mph. There is another white sign at the other end of the long Trestle. They are old, and small, and definitely need to be replaced with new, larger, signs, and supplemented with more signs at all the access points to the trail. As you can tell the long Trestle is used by cyclists, joggers/walkers, and Equestrians, and has a little bend in the road at one point. Between the Trestles is an access trail for Equestrians, that is also popular with people on Mountain Bikes from what I've seen by the tracks in the dirt. The small trestle is for cyclists, and joggers/walkers, and can make for a difficult spot to navigate on a busy day. Why there are no posted speed signs here is beyond me. Just after passing here I watched a woman on a jury-rigged bike head east, toward this, at 20mph. Her bike had a 2nd seat, and a wheel, both lower than the back of her bike, and in this seat, doing her small share of the pedalling, was the womans little daughter. At least they both had helmets. 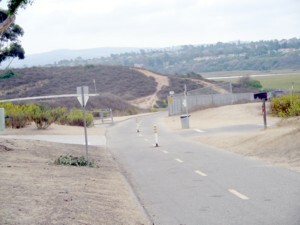 Beyond this point are entrances to the Nature Center, and a large parking lot, that are accessed from a street called University, that brings people from Irvine Ave., and beyond that is a stretch of trail that heads south, parallel to Irvine Ave. to its end near Santiago St. In my next post I talk about the entrance area, the last section of the trail, and a chance meeting with local officials. The north side is a busy place, especially on weekends and, as you can tell, is a place where care should be taken, by all who use it, to do so safely. How to Fight Capitalism With Bicycles? It has been several months since I last checked in on the wider Blogosphere to see how it covers Bicycling, and when I discovered the following I knew, despite it being about Mountain Biking, that I just had to share it. Mountain Bike Tour on the Ho Chin Minh Trail Explosion from the Past! Relieve your rich bourgeois guilt and fight capitalism at the same time, for only US$2,220 per person (child prostitutes sold separately). The story, and it's photos, is an interesting one, and ought to interest those folks into Touring. I Love riding in the Upper Newport Back Bay. It is so cool, peaceful, and beautiful, at 7am in the morning. Since my move to Santa Ana, over a year ago, I had not been back, and I miss the experience. But the story that was brought to my attention ( Part 1, with a link to Part 2. ) led me to make a return on Sunday, Oct. 1st, from 10am to 2pm. This is the 1st of a 3 part report on that visit. I decided to begin from the more civilized end of the Bay, with its boats, RV Park, hotels, apartments, and a brand new park with a Trail, and a view. As I head down the trail to Backbay Dr. I have apartments on my right, and , on my left, an old well used trail that leads, below Pacific Coast Highway, behind the RV Park, for about a quarter mile, and leads one back to the highway. Once on Backbay Dr. I enter a Bike Lane that runs a short distance to Shellmaker Rd. ( There is a lane on the opposite side of this stretch as well. ). For the next several miles I would share a street with the occassional car, and cyclists heading east, and joggers, and walkers, heading in both directions. On the other side of the road is a Bike Lane shared by cyclists heading west, and joggers, and walkers, heading in both directions. There is little, or no, room off the pavement, outside of staging areas for parking, including the curbs on San Joaquin Hills Rd., where it meets Backbay Dr.. 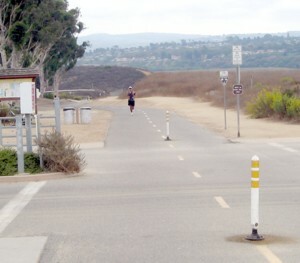 The whole trail system here, on both sides of the Bay is policed by the city of Newport Beach. Along the south side there are posted signs that explain the muti-use nature of the route, and make plain that the speed limit is 15 mph ( 10 in the dips. ) for all vehicles. This pic was taken east of San Joaquin Hills Rd. This is another shot east of San Joaquin Hills Rd. As you can see the cyclist goes by the walkers. He is hugging the line, however, though there is no traffic coming toward him. He did not let the walkers know he was behind them so that they could, theoretically, move to their right , and out of his way. This left him the choice of hugging the line, or crossing it for a wider passing. Walking, or jogging, what if the 2 people, unware, had suddenly moved to their left? There are several such as this, here. Just before these fellows came by I saw some thing that was quite troubling at this location as I was getting out my camera. A collection of 9 spandex-clad riders, probably from a local club, riding in 3 rows, 3 abreast, at a speed faster than the posted limits. Not a pretty thing to contemplate is it? Along my way I stopped to talk to walkers, and joggers, about their experiences on this road and, while some talked of encountering cyclists riding too fast, riding too close, not alerting them as they approach from behind, and even being verbally abusive, they, and others, talked of cyclists being friendly, and giving heads-up as they come from behind, and go by. At the rest area on the corner of Backbay, and East Bluff, I talked to numerous cyclists about their experiences on the same stretch. While they talked of verbally abusive walkers, and joggers, they also talked of friendly, and co-operative people as well. No-one, in either group of users, could recall accidents, but would not have been suprised if there had been any. I next headed east on the sidewalk, a block, then north to the other side of the Bay, and it is on this short stretch where the possibility of an accident is very real indeed. It is here, on a trail parallel to Jamboree Rd, between East Bluff on the south, and Bayview Way, that there is a very tight intersection of 2 trails. 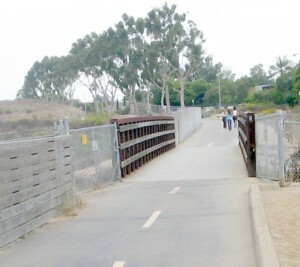 On the left you can see a turn-off that dips down, and goes right to pass under Jamboree, becoming the San Diego Creek Trail. The speed limits are posted, and confusing. Heading north the sign says to pass at 5 mph, as you go by, or make the turn. Heading south the sign says 3 mph. Down in the connector are signs telling riders, in both directions, that the speed is 15 mph. It is important that cyclists, walkers, and joggers, be careful out there. With various activities possible here, from nature tours, and other sponsored events, to groups of club riders, high school, and college, track squads in training, families with kids, and strollers, people with their dogs, and equestrians, especially on busy weekends, there can be alot of people using the trails. With the section I've just written about an integral part of the Mountains to the Sea Trail usage is becoming more popular. My next post will begin to explore the north side, and discuss safety issues in the area. According to a brief report yesterday, by Jaimee Lynn Fletcher, of the OC Register, the city of La Habra intends to apply for a grant to study a possible Bike Path along the Union Pacific Railroad Corridor, crossing the entire city. This route, according to my Thomas Guide, stretches from Valley Home Ave., between Story Ave. and Wilshire Ave,, on the west side of town, crossing Beach Blvd., Euclid Ave., and Harbor Blvd., before leaving town at Lambert Rd., between Harbor and Palm St.. I will see what more I can learn about this story, and visit the proposed route for a future report. The city of San Juan Capistrano will be celebrating the opening of a new Bike Trail Undercrossing, called the Verada Bikeway Undercrossing, in the city, on October 28th with a family friendly event. The city is giving away 200 bike helmets to the 1st 200 kids who show up at the event. The link has been under construction for 7 months, and is an important addition to the city trail system. There will be a bike ride, and walk, refreshments, and more. The event is at Descanso Park ( Next to City Hall, at the end of Paseo Adelanto. ) at 1030 am. The Trail System in this historic city is extensive, and has its origins in the adoption of both a General Plan Bike Trail System, (paved trails), and a General Plan Hiking and Equestrian Trail System, (unpaved trails), in the late 1970's, and due to the growing popularity of Mountain Biking those folks can now enjoy the unpaved trails if they dare. You can see a map, with a dencent enlargement link, and learn how to pick up, or order, the paper map, on this city webpage. Does this image trouble you? Does it make you angry? At the motorist in the backround? Yes, I staged the shot. The car is empty, and the road not seen, behind the camera, is a deadend. What if the road was not a deadend? What if I had been riding safely along, and been struck by an unsafe driver? What if I had been the one traveling in an unsafe manner, and been the cause of the collision? What if we both did something stupid? 2006 has been a year of tragic "what if's" for cyclists, and a few joggers as well, in Orange County, and it took a simple question, e-mailed me by a fellow cyclist, to bring this to my attention, and make me realize that while I did not want to turn this blog into an un-relenting cataloging of national road woes, it was important for me to pay attention when it happens where it affects me the most. Orange County is my backyard. It is where I commute to work, and shopping. It is where I ride for exercise, and to relax on a day off. What happens here concerns me, and should concern all county cyclists, whether an activist, a Club Rider, a racer, an active daily rider, or a part-time cyclist just out to ride a few miles , wherever, once, or twice, a month. Now that I've begun writing about 1 local cycling issue it is time for me to begin to try to address a 2nd. The 1st story involves Class 1 and related, Trails. Last month a local cyclist took me to task for not covering a prominent local story, and vented his anger at the person responsible for an entirely avoidable tragedy as well. I have discovered that there is a bigger, year long, story here, and that cyclists are not entirely innocent victims. 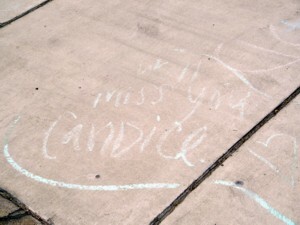 Why don't I see anything on your blog about the murder of Candace Tift? Um...... maybe because I did not know about it. Not everyone subscribes to the OC Register, or even reads it every day you know. The link you gave me didn't show me the article so I will do a search to see what the story says. While I have written about an incident or 2 over the years I have learned, from what turns up in my Google Alerts, that there is just too much of this happening in the world, and even locally, and I refuse to make my blog a catalog of the negative, and depressing. While many such incidents are the fault of the motorist, it is just as true that many are the fault of the cyclist for any number of reasons. The best thing I can do, as an advocate for cycling, is to promote resources for learning how to ride safely ( See sidebar, and past, and future blog entries. 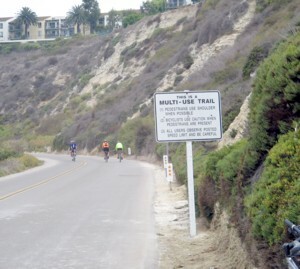 ), and let the public know of changes in communities, for the good, that make cycling safer ( I'll be checking out the new extension created along PCH in Dana Point soon, with a picture. ). She was riding on the sidewalk with her dog on a leash. 2006 Lexus jumps onto sidewalk and kills her. Driver arrested for being under influence of prescroption drugs. Bikers are dying. I ride that route often. I am concerned about this fading from the spotlight. I think it is important that a message is sent that it is not OK to take xoloft, drive a car and kill people. At work, during a break, I got the link to work, and printed out the story. 13 accidents in 6 months in the OC???? That is troublesome regardless of the individual circumstances. Like I said before finding google only bringing accidents to my attention was not what I hoped to use it for because I wanted to encourage people to ride not scare them off from it. But I live in the OC, and there is certainly no reason why I can't keep an eye out for stories such as these WHERE I RIDE. I have no clear idea just how many area cyclists, and clubs, know of the Dude, despite my leaving flyers in shops, and just hope they are because there is a lot of good, safe riding here. I will read the story on my bus ride home tonight, and get back to you soon. Okay, I've read the piece, and with now 13 cycling related incidents in 6 months am outraged at the senselessness of it. 1. Why was she not wearing a helmet? 2. Why was she riding on the sidewalk? Last month I posted about cycling laws in the county, and it's against city law to ride your bicycle on Newport Beach sidewalks!! Did she, or her family, and friends, KNOW this? 3. Why was she riding in the company of her dog, especially where she was doing it? On the Santa Ana, San Diego, or Mountain to Sea, Trails I can understand, but on public sidewalks, or streets? I know you may know the woman, and her family, and my questions may seem insensitive but, if I am going to write about such events as this, I would be shirking my responsibility by not addressing these issues as well as what the motorist did. BTW, are you a club cyclist, or have a cycling website I might want to link to? Not sure if you received my last e-mail, and was wondering if you are, as you say you are, " feeling very "Old Testament" about this..." what you had to say about it. Don't be afraid to disagree, I can take it. Tomorrow, I am going down there to take some photos for a post. No, I do not know the woman in quesiton. I beleive it's tragic and am concerned that the entire matter is going to be swept under the carpet. 1. Yes, she should have been wearing a helmet. I'm not sure it would have saved her. 2. There is no indication that riding with her dog on a leash had any impact on her ability to avoid the Lexus. 3. Yes, I know that it's against the law to ride on the sidewalk in Newport Beach. That is a STUPID law. Sometimes the sidewalk is the only save place to be. In any event, the 52 yr. woman who was stoned on prescription drugs left the roadway, killed a beloved school teacher/bicyclist, and she is free to walk the streets. How can bicyclists be heard? Old Testament...."An eye for an eye"
I know that won't happen, but I feel that 10 years in prison is appropriate. 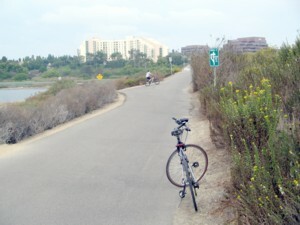 I've ridden the Dana Point route. It's very scary. Yes, people should wear helmets. 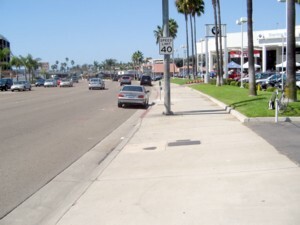 They should follow laws, except stupid ones like the Newport Beach sidewalk law. > No, I do not know the woman in quesiton. > I beleive it's tragic and am concerned that the entire matter is going to be swept under the carpet. Well, I'm going to do something on my blog. > 1. Yes, she should have been wearing a helmet. I'm not sure it would have saved her. I agree that chances are it might not have, but only her family, and those who treated her will know for sure. > 2. There is no indication that riding with her dog on a leash had any impact on her ability to avoid the Lexus. Probably not based on the description of the incident I was given by an employee at the dealership. The car came from behind. My point is that she should not have had her dog along at all, especially not there. > 3. Yes, I know that it's against the law to ride on the sidewalk in Newport Beach. That is a STUPID law. Sometimes the sidewalk is the only save place to be. Sorry it's not stupid, and the sidewalk is never the safest place to ride a bike, though it might be the only place to ride, especially for kids too young to ride the street. As I was checking out the accident scene, a car pulled out of the car lot into the sidewalk path, and any person riding a bike, and distracted, day, or night, would not have seen it in time. PCH, even as it allows for parked cars, IS a Bike Route ( Green signs. ), and any cyclist who does not know how to safely take a lane to avoid parked cars should definitely avoid it in many stretches between Newport Blvd., and Crystal Cove, and many places further south as well. > In any event, the 52 yr. woman who was stoned on prescription drugs left the roadway, killed a beloved school teacher/bicyclist, and she is free to walk the streets. > How can bicyclists be heard? Yes, she was wrong, I agree, and should be punished. Cyclists can be heard by writing letters, and blog posts, and speaking up at community meetings. Another important question to ask is why so many cyclists are not as knowledgeable about cycling safety, and cycling issues, as they should be? I have yet to hear from Phillipe about what I had to say in my last e-mail. I know he, and other cyclists, especially ones with "issues" toward motorists, may not want to think about certain things in regards to the rash of accidents that has overtaken the OC cycling community this year, but avoiding them won't make them go away. Too bad Phillipe didn't consider my last thoughts worth a reply. I'll hold out hope that it's possible he overlooked it in a crowded inbox.